“Save the whales.” This phrase has almost become a clichéd slogan for the environmental movement. But there was a time when whales were in great danger of disappearing from the Earth. Since Earth Day is right around the corner, I’ve decided to write about an excellent documentary from the 1970s that focuses on the bowhead whale, which at one point was decimated almost to the point of extinction. The expedition was to include American and Soviet biologists as well as a film crew, and the NFB was eager to take part, especially since this was to be a joint US-USSR expedition. Environmental filmmaker Bill Mason agreed to film the expedition, with Chester Beachell handling the sound recording. Unfortunately, the Soviets pulled out at the last minute without explanation. Since everything was already in place, the expedition went ahead. The nine members (including Mason, Beachell and two underwater cameramen) made their way to Icy Cape, Alaska, for three weeks in April 1973 in an attempt to film this elusive whale. 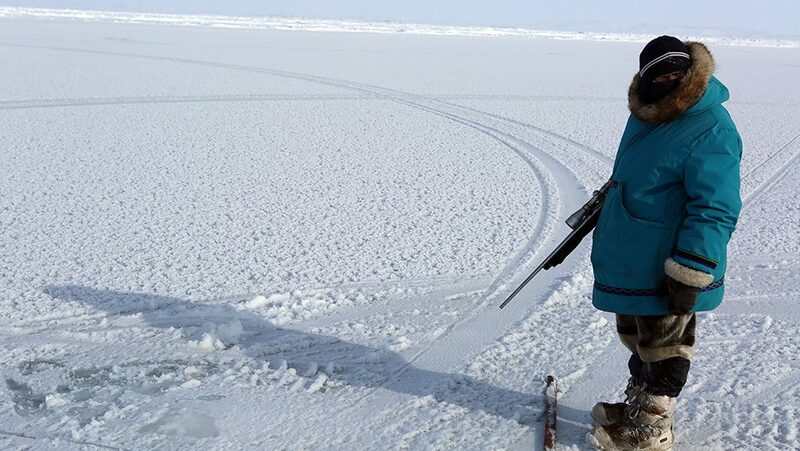 No one knew where the bowheads spent their winters and summers, but Inuit in Alaska confirmed that Icy Cape was near where the bowhead travelled every spring on their way to the plankton-rich Arctic Ocean. As you will see in the film, the journey from the expedition base to the ocean channels could be made only by helicopter. Temperatures were so low that the helicopter’s engine could not be shut off, as it might never restart. This severely restricted the amount of time the men could go out on the ice, and the helicopter had to stay nearby for fear of losing sight of the men and not being able to find them again. Logistically, this was a very difficult expedition, and Mason was not happy with what he managed to film. It was more than a week before they saw whales of any kind in the water. Towards the end of the expedition, they finally spotted some bowheads. The underwater cameramen were quickly flown to the spot and managed to get some rather murky footage of belugas and bowheads. Mason, however, captured some spectacular shots of the bowheads from the ice. Mason wanted to assemble a 30-minute documentary as he felt he didn’t have enough footage of the whales, but the CBC was very impressed with what they saw and requested a full hour. Instead of just showing the one film, they decided to put together a special evening dedicated to showing the Arctic in all its beauty to Canadians. On May 1, 1974, at 8 p.m., Inukshuk: The Presence of Man was broadcast on the entire CBC network. The two-and-a-half-hour program included several animated short films by Inuit animators as well as other NFB documentaries on the Arctic. In Search of the Bowhead Whale was singled out by reviewers for its terrific images and subject matter. The film was selected by several festivals and won, among other honours, the Jules Verne Award for the Best Exploration Film at the first International Festival of Films on the Arctic in Dieppe, France. It was also sold to a handful of international broadcasters, including NHK Japan and the BBC. Considering the difficult conditions in which the film was shot, the final product is surprisingly good. Mason added a few sequences explaining why the bowhead was hunted so intensely by whalers and how close it came to being wiped out as a species. I invite you to watch this lesser-known Bill Mason film that puts the spotlight on these beautiful creatures. Whales are still in danger, but thanks to the efforts of agencies like the World Wildlife Fund, they are better protected and their numbers are slowly increasing. This film certainly did its part in helping educate the public about the plight of these animals. A brave, fascinating film even if we don’t actually get to see much of the blowheads. And a terrible commentary on the continuing slaughter. Yes, definitely a typical Bill Mason endeavour, with the qualities of enthusiasm and great cinematography that make you forget other flaws, such as too much music and a few redundancies. Congratulations on this great choice of film for Earth Day!